As night casts its shadow across Green-Wood, step through the iconic Gothic Arches and into an unforgettable experience of ethereal sights and sounds. 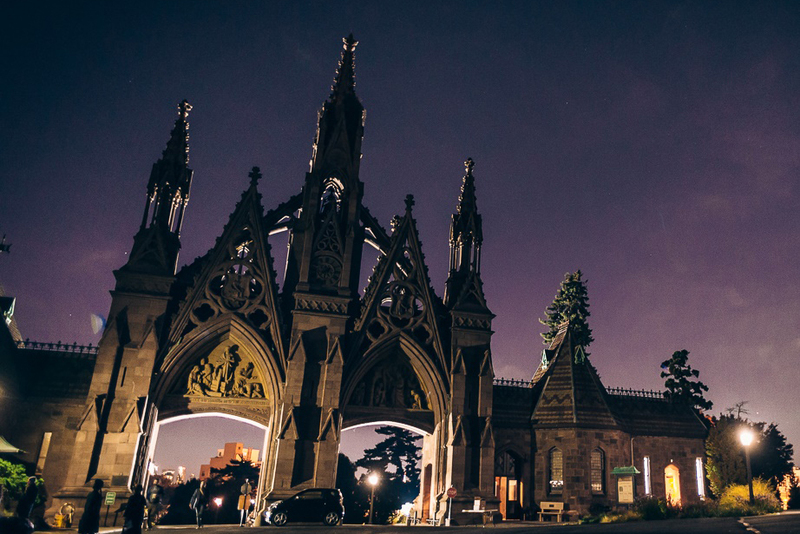 Rooftop Films, Green-Wood Cemetery, The Moth, Bindlestiff Family Cirkus, Morbid Anatomy and Unison Media team up to create one of the most mysterious evenings in Rooftop or Green-Wood's history. Guided by the thousands of flickering candles, you’ll wander along the Cemetery’s winding paths and have chance encounters with musicians, moving images, performance artists, and storytellers. It all takes place against the stunning backdrop of one New York City’s most historic and storied landscapes, lit by the light of the silvery moon. This event is strictly 21+; I.D. required. Visitors will be walking through the Cemetery at night; appropriate attire is recommended. Venues are not handicap accessible. Each evening will feature similar programming. Entry is only permitted on date stated on ticket.